Wow! Even the giants are feeling the heat. This is bad real bad. They need to mine, grind, heat and package the results. Takes time! But Bamburi shareholders are better off than ARM shareholders. 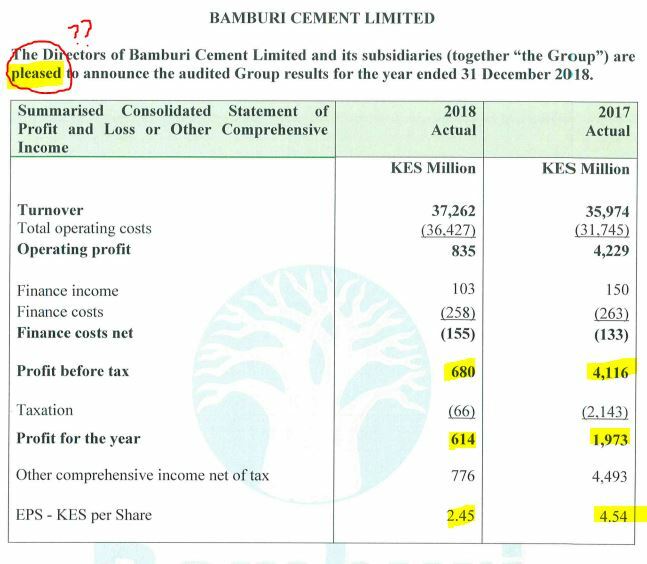 Bamburi cement sneaked in results on friday evening. That's a hefty dividend compared to the EPS. The board sees a better 2019. This is an improvement from the recent slump. i have not gone through the results.I will find time for it later.But they are very generous on dividends. They cited competition and election effects.Lets see Full year results how it turns out to be.Compared to ARM and EAPC,i only see bamburi as viable. Nyanza super alliance(NASA)comment makes for the category. Since that comment, ARM has gone with his monies (let me be sadist but that is the truth). Of course even Bamburi is struggling in the sector. .....and this, Ladies & Gentlemen, is my BUY signal. The exchange bar has been doing a good work in banking.Lets see how it fairs in this other sectors.